The Castle of Mey is the most northerly castle in mainland Scotland. It looks out over the Pentland Firth to the Orkney Islands from a location a few hundred yards inland from the coast some 13 miles east of Thurso and some 6 miles west of John o' Groats. Simply viewed as a castle, the Castle of Mey is a real delight: a feast of turrets topping off a confection of honey-coloured stone. Modest in size, the castle is in excellent condition and its different elements merge to produce a very homely residence you could almost imagine yourself living in. Combine the castle with beautiful gardens, an animal centre and a superb new visitor centre, tearoom and shop, and you have somewhere that should be viewed as an essential port of call for anyone visiting northern Scotland. 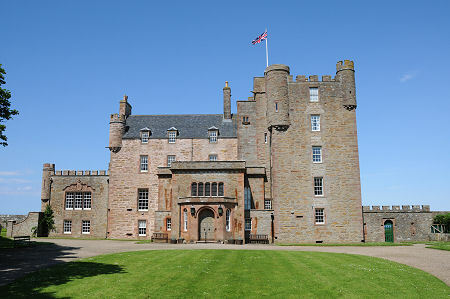 But the Castle of Mey is, of course, not just an ordinary Scottish castle. In June 1952 what was then known as Barrogill Castle had been on the market for months when it was chanced upon by a visitor to Caithness. The very recently widowed Queen Elizabeth The Queen Mother was spending time following the death of King George VI with her friends Commander and Lady Doris Vyner at their house at Dunnet, just along the coast. Barrogill Castle was in a poor state of repair, and had no bathrooms and no electricity. Nonetheless the Queen Mother fell in love with the castle and in August 1952 it became the only property she ever personally owned. The only thing the Queen Mother really didn't like about her castle was the name, and Barrogill Castle quickly became Castle of Mey, to reflect the original name of the castle and the nearby village of Mey. Major restoration and improvement followed, a process which brought Castle of Mey up to the standards of a fine home of the mid 1950s. 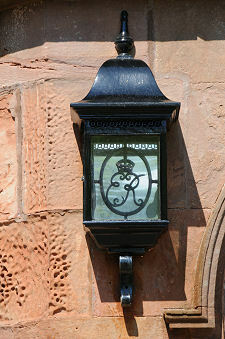 The Queen Mother also oversaw the development of the gardens at Castle of Mey and added touches of her own to the exterior of the castle, such as the sandstone cypher carrying her crest above the dining room window and the lamps flanking the front door. She also had cannons moved from a nearby 18th Century coastal battery to the front lawn of the castle. The Queen Mother holidayed at the Castle of Mey every year for nearly 50 years, her last visit being in October 2001 at the age of 101. It is not unusual for individuals to feature large in the stories of Scottish castles, but nowhere else is the personality of a castle so deeply entwined with the personality of just one owner. 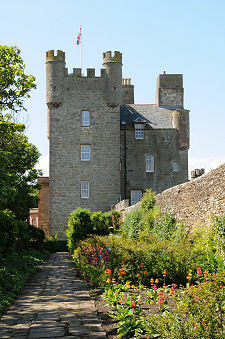 And it is the Castle of Mey's long standing and extremely deep links with the late Queen Mother which still bring it to life for visitors today. Having restored and updated the castle, the Queen Mother then did little more to it beyond routine maintenance. She held the view that if something worked, then there was no need to fix or replace it, and the result is that many of the functional areas of the castle feel a little like a time-capsule from the 1950s. 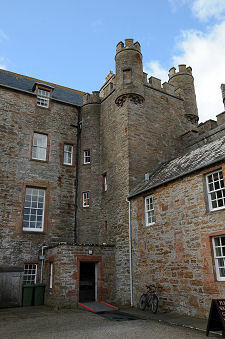 It is obvious that the Castle of Mey was viewed as a deeply personal retreat for the Queen Mother and other visiting members of the Royal Family, and fixtures and fittings that appear old fashioned or even austere to modern eyes were clearly all part of the experience of living here: and for today's visitors all part of the fascination of touring the castle. Your visit to Castle of Mey begins in the excellent visitor centre near the car park, where you buy your ticket and perhaps enjoy the offerings of the teashop and gift shop. You then make your way past the west end of the castle to the main door on the south facing front of the castle. In doing so you pass the entrance to the walled garden: we have a separate feature about the Castle of Mey Gardens and the animal centre. In the front hall of the castle you are greeted by the first of a number of guides you will encounter on your tour, each ready to talk to you about a different room or set of rooms. Some actually worked in the castle during the Queen Mother's lifetime, and their personal insights are fascinating. 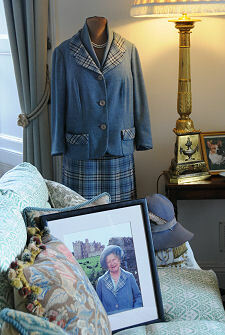 The Queen Mother's continuing presence in the Castle of Mey is obvious throughout, and this starts as soon as you pass the front door: within the hall are the blue raincoat coat and the wellingtons she always wore when walking in the gardens and grounds. In the front hall you also begin to get a sense of the Queen Mother's eclectic taste in items of furniture and decorative objects, many of which were purchased locally in Caithness. 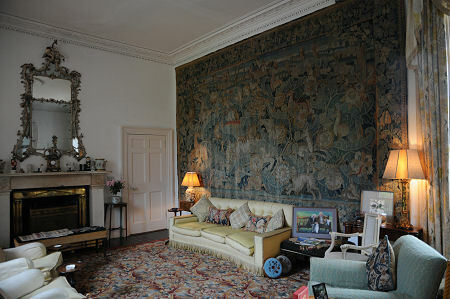 The first main room on the tour is the drawing room. This would originally have formed part of the castle's great hall. Today it is a comfortable and homely sitting room in which the Queen Mother entertained her many guests at the castle in front of a peat fire, boiling the water for the tea and making the toast herself. Here you also begin to get a sense of a strong undercurrent of humour and playfulness that clearly ran through life at the castle. Younger guests staying here were encouraged by the Queen Mother's Private Secretary to present her as a thank-you with the tackiest gifts they could find on sale in the area, which explains the presence, peering out from behind tapestries and ornate mirrors, of Nessies, Gonks and other unexpected ornaments. Large connecting doors lead through to the Equerry's room, which served as an office during the Queen Mother's stays at the castle. Today this is dominated by an excellent painting of the Queen Mother with the Castle of Mey in the background. There is also a display reflecting the Queen Mother's interest in farming and cattle. Beyond is the library, used by the Queen Mother in later life as her private sitting room and study. Items of personal correspondence include the text of a telegram sent to the Queen asking her to buy lemons in Thurso when the Royal Yacht Britannia berthed in Scrabster, as the castle had run out of them. Family photographs and mementos rub shoulders with items presented to the Royal Family in Caithness and more humorous ornaments. On the castle's bedroom floor visitors can see from the doorway the Queen Mother's bedroom, offering views north, south and east, and the castle's only ensuite facilities. The Queen Mother still used this room at the age of 101, despite its access by spiral stairs. When she was staying at the castle her corgis occupied the steps immediately outside the door. The Private Secretary's bedroom gives a sense of the pleasant but fairly basic facilities available to most staying at the castle, and the next room you view was used to store the Queen Mother's clothes. The only four poster bed you will see on the tour can be found in Princess Margaret's bedroom. Despite the name, Princess Margaret never actually spent the night here. She found the castle cold and basic compared with the comforts of the Royal Yacht Britannia, on which she slept when the family was visiting. Other bedrooms on view were named after the couple who the Queen mother came to visit in Caithness in June 1952, Lady Doris Vyner and Commander Vyner. 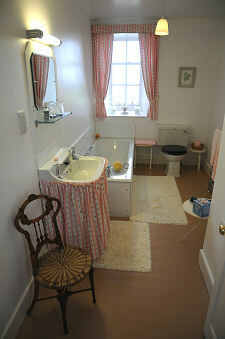 In passing between rooms you can view the contents of the cleaning cupboard for the bedroom floor, complete with a fascinating collection of household objects from the 1950s and 1960s. Close reading of the label of the packet of "Archer Silk Toilet Paper" reveals its contents had more to do with paper than silk. Your tour of the Castle of Mey then takes you back down a floor to the dining room, which is next door to the drawing room you saw earlier. This is by far the grandest and most formal of the castle's rooms, and was intended to entertain a modest number of guests to dinner. 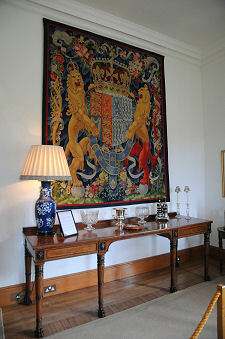 The east end of the room is dominated by a magnificent tapestry carrying the Queen Mother's coat of arms and made in Edinburgh in 1950. The fireplace at the other end is home to a superb bronze fire-back. Behind the dining room is the butler's pantry, complete with domestic appliances that are half a century old, and from here steps lead down to the kitchen. This is, unusually, placed on the ground floor at the front of the castle. Pride of place in the centre of the kitchen table is given to a box of lemons, perhaps, you are tempted to suspect, meant to represent those collected by the Queen's party in Thurso in response to her mother's telegram. You exit the castle through the original front door, which now leads into a courtyard at the rear of the building: having experienced one of the very best castle tours you will find anywhere. Caithness was traditionally a Norse possession, and after the area became securely part of Scotland much of it formed part of the estates of the Bishop of Caithness. After the Reformation of 1560 the lands passed to George Sinclair, 4th Earl of Caithness. Between 1566 and 1572 he built what he called Castle of Mey. This was a typical "Z" plan tower house with a main block and two offset corner towers. A lower western extension was added in the 1700s, at which time the name seems to have been changed to Barrogill Castle, and further additions were made by the architect William Burn in 1819. The castle remained the property of the Sinclairs of Mey until the 15th Earl of Caithness died without issue in 1889, when it was sold. 63 years and two owners later the castle was purchased by the Queen Mother. In 1996 the Queen Mother transferred the castle, estate and nearby farm to a trust she had formed to secure their future. The President of the Queen Elizabeth Castle of Mey Trust is the Prince of Wales, who continues the family tradition of holidaying at the Castle of Mey.